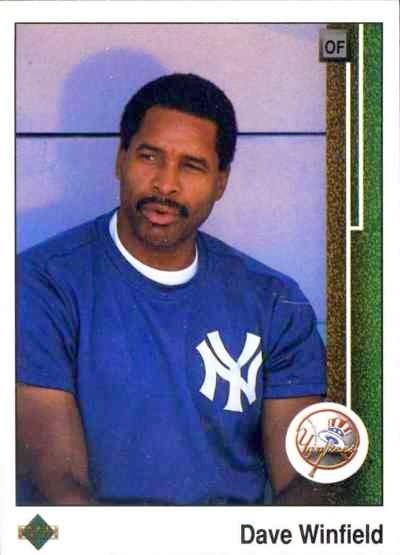 I get self-conscious about collecting when it's mostly a solitary activity for me to hoard cardboard - I have to find ways to keep baseball cards a 'thing' so I can kind of feel like I still have some sort of purpose and not just some kook. For the last couple of weeks, I've tended to my 25-30 mini-collections - that means hunkering down, listing my 2015 adds in my collecting topics / mini-collections database as well as listing cards I've pruned from my A-Z archives of commons. I really wonder why I care about a countless number of commons and/or base cards - it's fun when I could occasionally flip through a grouping of cards and see a theme that has me amused. As my latest batch of collecting topics cards are listed [and sort of put away in temporary boxes], my focus will shift through my loose inserts - several years ago, I started to list my inserts in a spreadsheet and put them away in binders. I lost interest over the few years as cards piled up all over the place - as is, I've busted open the box of plastic sheets I bought two or three years ago to restart the process of putting inserts away. I need to make sure that most inserts [parallels, oddball issues, etc] are accounted for - even if organizing them really just means they are in a binder somewhere. Maybe I'd really like to figure out things about my spreadsheet - discover forgotten cards, try to sort cards by team to perhaps serve as trade bait and see if I can generate 10-15 trades by posting a listing of cards by teams. 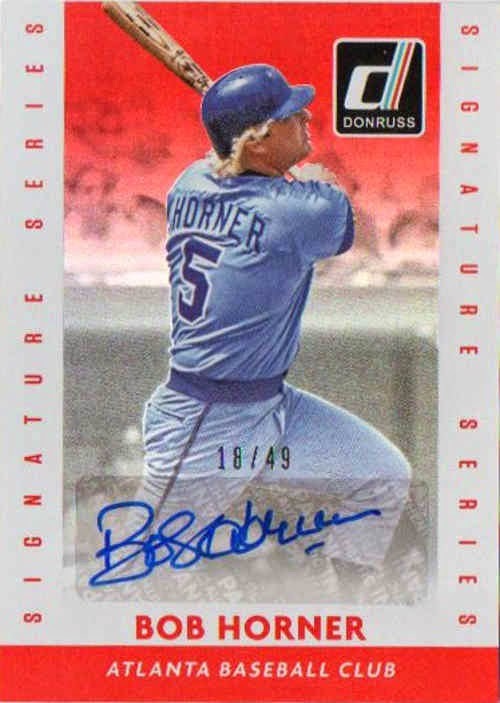 It's nice to pull any autograph from loose packs and while the retired player shown is not exactly the type of guy I'd associate with a 2015 baseball card product - it's a card I can add to my award winners collection, since Horner was the 1978 National League Rookie of the Year. I guess I've been on sort of a Donruss kick - the base cards are bland and seem like filler, but the parallels and inserts give the product a little bit of life. 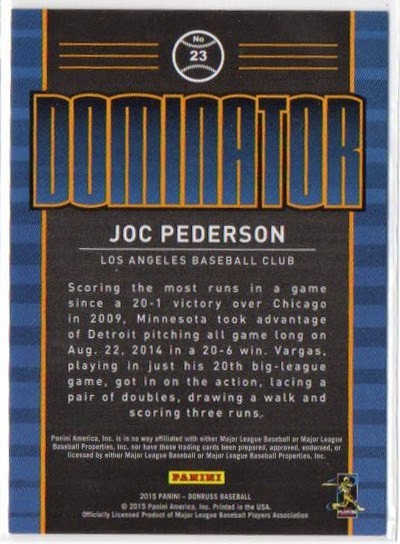 If Tomas plays, he'll have his share of cards, ones that will actually picture him in an Arizona Diamondbacks uniform - but I figured to pick one this VIP Reserved insert, serial #'d to 99, just to put away for now. There have been rumblings that Tomas isn't going to be a particular great player especially if the Arizona Diamondbacks are insistent he stick at third base - he could have a season like fellow Cuban Jose Abreu in 2014 or might find himself with no immediate place to play, despite his immense power potential. 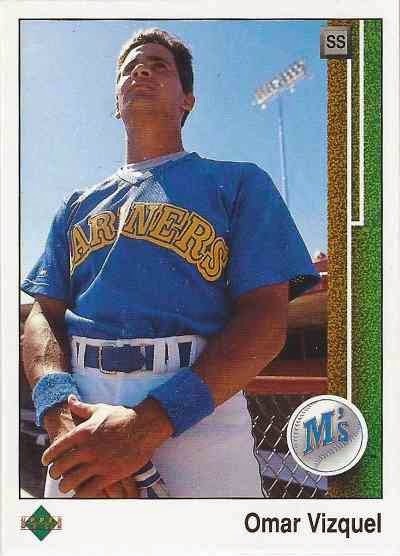 At my LCS, I rummaged and dug through two monster boxes consisting of 1989 Upper Deck and 1993 cards [from a few brands including Donruss and Upper Deck] - I grabbed a bunch of cards that fit a number of mini-collection themes and in all, I had at least 120 cards I wanted to take home. However, it's not like the cards were discounted since they'd been collecting dust and were in mothballs for the last 20-25 years - I still had to pay a quarter a card and probably at least $30 if I took home all the cards I found. 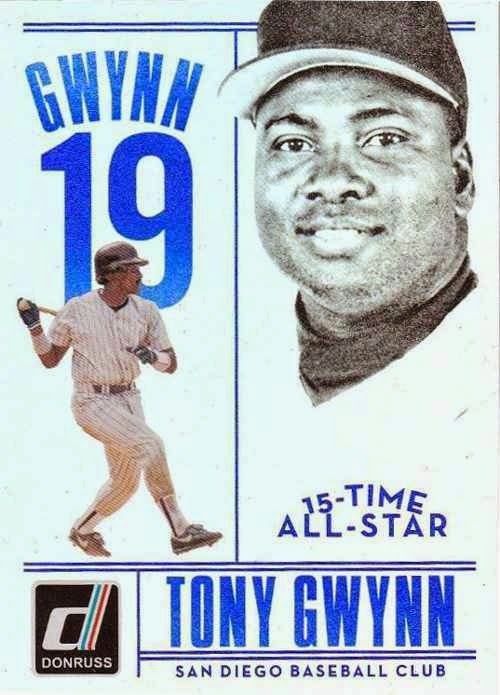 I had to slow down and whittle down my stash into something more reasonable - I put away the 1993 cards I pulled, figuring I could just pick up a full 1993 Upper Deck set instead of fooling around with loose cards. 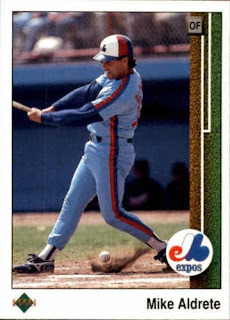 I could probably pick up an 1989 Upper Deck set or at least end up with a lot of assorted cards - but there is still a little mystique with UD's inaugural brand, so I relented to pick up a handful that really appealed to me. 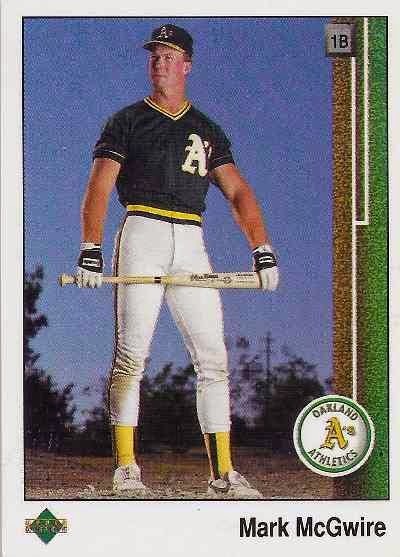 1989 Upper Deck Mark McGwire #300 - I've always associated the image as one that might be used on a poster. 1989 Upper Deck Mike Aldrete #738 - my best guess is he's swinging at a ball in the dirt. 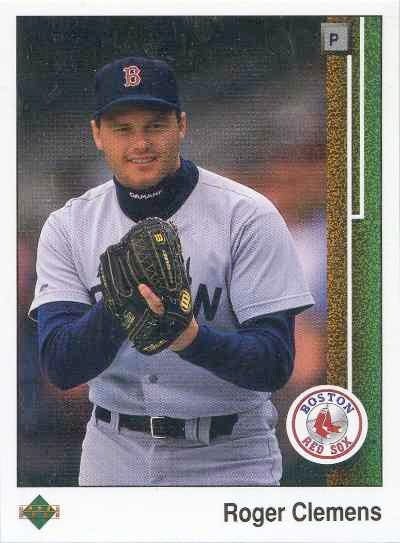 1989 Upper Deck Jim Abbott #755 - this might have been his most popular rookie year card. This doesn't really fit into my collection but I picked up to complement a 2012 Bowman Chrome autograph I pulled several years ago - even though the card is unlicensed, it's nice and shiny. Turning it over though, I see one big mistake - the highlights listed are not about Pederson at all, but Kennys Vargas of the Minnesota Twins. My team is the Angels and while I may say I'm interested in a number of non-Angels players like everyone else - I'm a one-team guy when it comes to collecting. 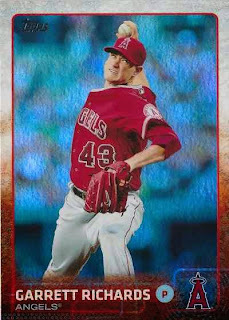 As is, I'm probably stuck to loose Angels inserts and base I may end up with like this Garrett Richards card I found - I can't get into high end cards, because it's all about Mike Trout, I kind of missed the boat on him, but now everyone is into him as the hot, young superstar. I don't like the idea of trying to complete team sets [too tedious, especially when it comes to junk wax years], but want a collection of different, Angels cards - I think I do have to de-emphasize my interests somewhat because while I covet Angels cards, but I don't want it so I'm held hostage by the need to have all Angels related cards [even if the player pictured aren't really favorites]. An idea would be to scour for cards of prospects, so I have some better cards of guys who maybe future Angel stars - though guys anointed as top prospects turn into busts, guys who seem like future stars are disappointments and guys get traded or even find themselves cut prematurely. 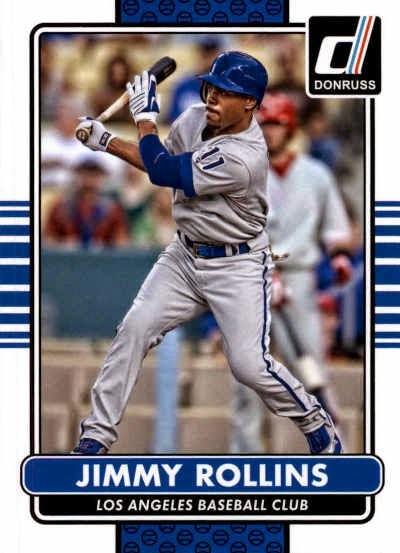 I was leafing through some 2015 Donruss base cards and found this Jimmy Rollins - he is sort of depicted as a member of the Los Angeles Dodgers baseball club and actually has him hitting at Dodger Stadium even though he hasn't played one single game there as a Dodger. It's not a big deal, it's originally an image of Rollins as a Philadelphia Phillies player - but I do think it's kind of odd to see the on-deck batter in the background with a red undershirt, wearing a red batting helmet. Hawkins still has holes in his swing but with his power potential, should find himself in the major leagues eventually - the outfielder had a fine spring with the Chicago White Sox and things maybe looking up. 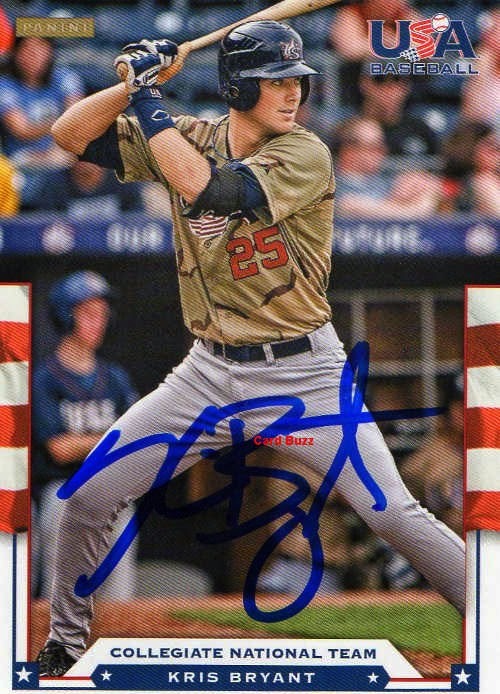 I wasn't sure about his signing habits but I had assorted prospect cards and a Future Stars 8x10 print I bought several years ago - so I was hoping to get at least the picture signed and maybe a few cards signed when I got out to Arizona for several days. 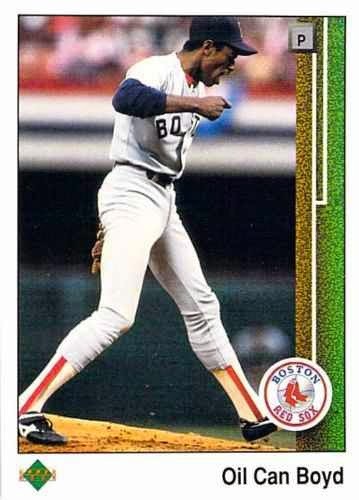 Hawkins was actually 'one per' guy, where he only signed one thing for a person at a time, but was actually cordial - he made sure to sign for anyone who wanted his autograph at Sox camp going out and coming back from practice. It doesn't change things from a autograph collector's perspective but I guess 'one per' is just how Hawkins rolls - when he was signing, he asked another collector if he was going to be around and told him that he'd sign more for him then as opposed to signing more than just one card at the particular moment. Even though there are a handful of fun inserts I should be eating up - for me, Opening Day is kind of just exist as sort of filler. Many of the cards came fresh out of the packs with the corners smashed - I guess I get what I pay for, but it's a waste of a cheap and fun break if I have to send more than half of the cards back to Topps. While I'm not a stickler for condition, particular with base cards - I want 'clean' cards as opposed to ones with visible imperfections. I don't know much about Kubitza except the Angels picked him up during the offseason - I got him to sign a couple of cards in the Arizona Fall League a few years ago, so his autograph is already in the collection if he plays in a game for the Angels at some point. Dare I dream that the 24-year old turns into a solid, but unspectacular player if and when he gets to the big leagues with the Angels - I don't think he's ever been regarded as a top prospect, but I'm just hoping Kubitza establishes himself as a useful MLB player for more than just a couple of years. With the crazy hype surrounding his spring training home run barrage, I'm glad I got him a few years ago - when I actually got him, he had probably shortened up his autograph already, but the recent graphs he has given out in-person just look real sloppy. Last week was all about 2015 Topps Heritage, but I got my fill through retail - so I when I finally stopped at the card shop this week, my interest in Heritage was kind of sated. 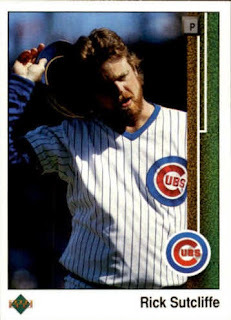 I heard 2015 Donruss was coming in and I bided my time just long enough [after already making a small purchase of loose quarter cards] - so the owner could get his shipment in and open up a box. 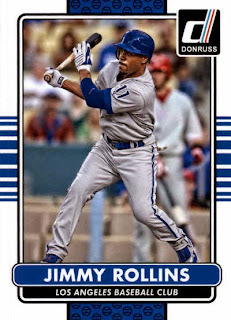 My gut tells me to stick with Topps because it's MLB licensed - but I grabbed a dozen loose packs of 2015 Donruss because as a baseball card collector I'm not going to be denied checking out some new product. 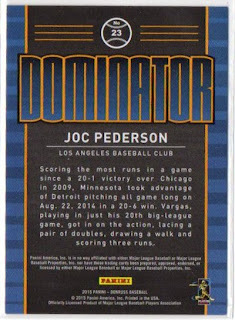 The handful of the inserts I pulled kind of pop and maybe the lure to picking up loose packs here and there - the Donruss insert sets that recycle designs from its past incarnation as a baseball card company are 'cute,' if not something to really put together. 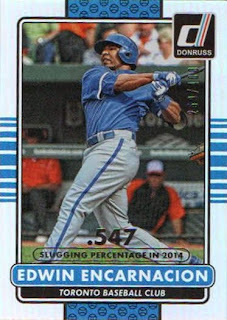 The base card design look a little calmer than 2015 Topps - the cards are printed with a glossy surface with no foil stamping. 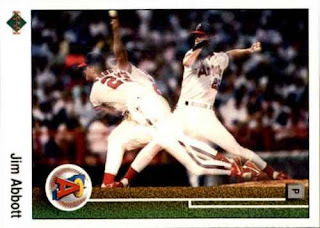 The red colored backs that almost resembles 1990 Donruss. The cards still sort of feel a step below a MLB licensed product, but I like it when there are no logos on uniforms / caps on cards of players who have recently switched teams - bonus points added if and when the new team is listed on the card as well. #1 Andrew McCutchen - Jersey Kings insert; while not a patch, the dirt stained material swatch used gives this particular card character. 2015 Topps Heritage blaster box [$19.99 each at the Target] - I used my $5 off coupon from my Topps coupon book available in Topps Series I blasters from Target. It's only one pack, but this was such boring break - I pulled one lousy insert, no short prints or anything else but base. #306 Rafael Ynoa / Jackson Williams - these are a pair of Rockies rookies from 2014, though Topps managed to make Williams into an Angel after he was claimed off waivers by the Halos during the off-season. 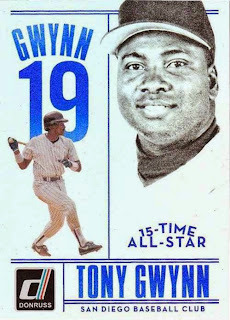 #288 Yimi Garcia / Melvin Mercedes - it may not mimic the original 1966 Topps set [or any vintage Topps set that had dual rookie stars], though I prefer as many players i.e. the rookies to actually have their own cards as opposed to two guys being put on one card. I heard about a 35-card Heritage hanger box and went to Target to see what they were about - I'm familiar with the Topps flagship 72-card hanger boxes, but I don't think I've ever seen Heritage hanger boxes. 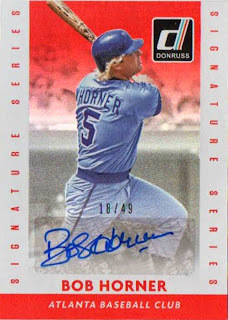 The Holofoil parallels look sharp though at first I thought they were the usual Chrome parallels from previous years - unlike the Chrome parallels, the Holofoils are not numbered and looks like a retail only parallel.